In Brief: A relaxing and easy 2–3 hour stroll between two villages on either side of the Great Wall, with an option to get a little more exercise by taking a climb on the wall that we pass on the way. 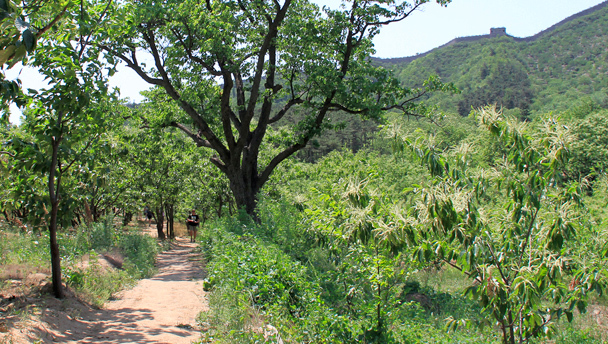 The trail leads through chestnut orchards, with the Great Wall on the ridge behind. Early start! We’re leaving early to avoid the worst of the holiday traffic. We may still get stuck in a traffic jam at some point, and we recommend you don’t make fixed plans for the evening. Bring a book or something to keep yourself entertained, just in case! Regular Beijing Hikers: this is the easiest version of this walk. A great way to try a hike if you’re not sure about your fitness, or if you have kids who would like to get outside. This is a nice easy walk with views of countryside and village life, a short visit to the Zhuangdaokou section of the Great Wall, and a look around a village that has sprung up in and around an old army barracks that used to house soldiers tasked with guarding the Great Wall. We will start with a look at the ‘Dragon and Phoenix’ pines at Zhuangdaokou, a pair of trees that are over 300 years old. From there we will walk up a stone-paved trail to a gate in the Erdaoguan Great Wall. It is an ascent of moderate grade—perhaps 30°—and will take no more than 30 minutes. We can climb up on the Great Wall for a look. It’s a good place to have a snack; adventurous hikers can climb the steep steps to visit a few of the nearby towers. The wall here has been partially restored, but only a small part – after a bit of a climb it quickly reverts to its ‘wild’ appearance. We will usually stop here for about 45 minutes to allow a bit of exploration. From the Great Wall we’ll take an easy stroll through orchards of chestnut trees on the way to the Walled Village. As we walk, we will be able to see how the Great Wall we just passed continues along the ridge, heading for the village as well. After a look around the Walled Village we will walk out to the road and meet our bus, and then drive to our lunch spot, a restaurant at the foot of the Huanghuacheng Great Wall. Hikers with extra energy have the option to finish lunch early and take a short climb up on to the Great Wall. It’s a very short hike, and if you’re looking for a Great Wall experience it might not be perfect.